What does the Apple Watch announcement this week have in common with Scottish independence? Both claim to be about time, both promise unlimited potential, and neither seems particularly necessary. In fact technology and politics converge nicely on the theme of utopia. Like a lot of tech, the publicity videos for the not-yet Apple Watch reinforce the benefits of the device with images of a whole world at your fingertips, the closed looping shape of the variety of wrist bands, and the roundy knob at the side called the crown. There are further round features on the back that record your heartbeat and transmit it to someone else. So they can feel it too. This is the new sensitive, feeling, and highly sociable world where your future is in your hands … I mean on your wrist. On the subject of tech and utopia, I’ve long enjoyed Edward Bellamy’s book about time, called Looking Backward 2000-1887, written in 1888. The book describes life in the year 2000, as imagined by a well-travelled 19th century American. At the core of such utopian writing is the triumph of reason. Bellamy describes his future world as one in which people enjoy “the blessings of a social order at once so simple and logical that it seems but the triumph of common sense” (93). With common sense comes freedom. As it happens, it also comes with compulsory national service. One of the miracles of Bellamy’s year 2000 was/is the transmission of music from performance rooms positioned around the city. Live performances are channeled into homes via hi fidelity telephone. There’s choice, “so that all tastes and moods can be suited.” This is also where time comes in. Before retiring for the night “by a clock-work combination, a person could arrange to be awakened at any hour by the music.” That prediction was almost on the button. Bellamy, Edward. 1967. Looking Backward 2000-1887. Cambridge, Mass. : Harvard University Press. First published in 1888. Free download from Project Gutenberg. In Bellamy’s steampunk socialism everything is connected by tubes and wires. Wirelessness wasn’t yet on the horizon. Nor was miniaturisation and personalised tech, though he did anticipate credit cards. 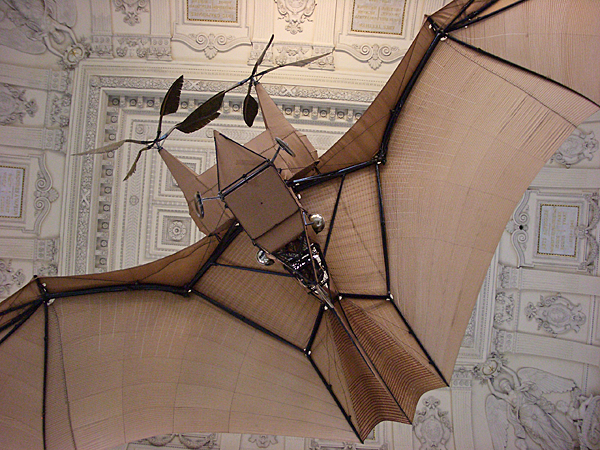 The image above is of a fanciful flying machines in a gallery at the Musee des Arts et Metiers in Paris. 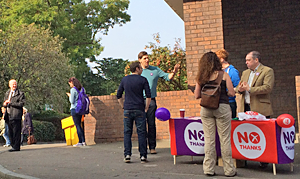 Below is a Better Together campaign stand in Edinburgh. I discuss Bellamy and William Morris’s utopias in Coyne, Richard. 1999. Technoromanticism: Digital Narrative, Holism, and the Romance of the Real. Cambridge, Mass. : MIT Press. On the theme of the circle see blog posts Circles and how to get out of them and Vitruvius does steam punk. Romantic utopian narratives often resort to circular geometries, which symbolise completeness and wholeness, rather than subdivision and fragmentation. See article “Majority of Scottish academics set to vote ‘no’ in referendum, THE poll shows” on why the majority of STEM (science, technology, engineering, maths) academics think we are better together. Richard, Bellamy’s prediction regarding music by telephone caught my attention. Perhaps not so surprising, since there was already experiments in the late 1800’s with music and telegraphy by Elijah Grey and Thaddeus Cahill among others. My husband’s grandfather owned a business until the 1980’s called Telephone Music. It was something of a jukebox by telephone – rather than live performances transmitted that way, there was a central office with multiple record players hooked up via telephone line to a juke box in various clubs and restaurants around the city. Patrons would lift the telephone handset from the jukebox and speak to an operator to request a song, which then would be transmitted to the venue. Needless to say, the audio quality via telephone line was not the best but the novelty of it kept them in business for a long time. That’s fascinating Lynn. In fact it is odd that Bellamy thought of distributing live music rather than recordings of music. The possibilities of the phonograph were known in the 1880s. I do recall being able to dial up the latest hits on a landline, though I can’t remember when. I also recall the sound quality of early portable transistor radios through an earpiece. So we were prepared to put up with a lot of distortion.